Round Electro Lifting Magnets(RELM) provide concentrated holding power and a deep reaching magnetic field to lift thick, ferrous items. 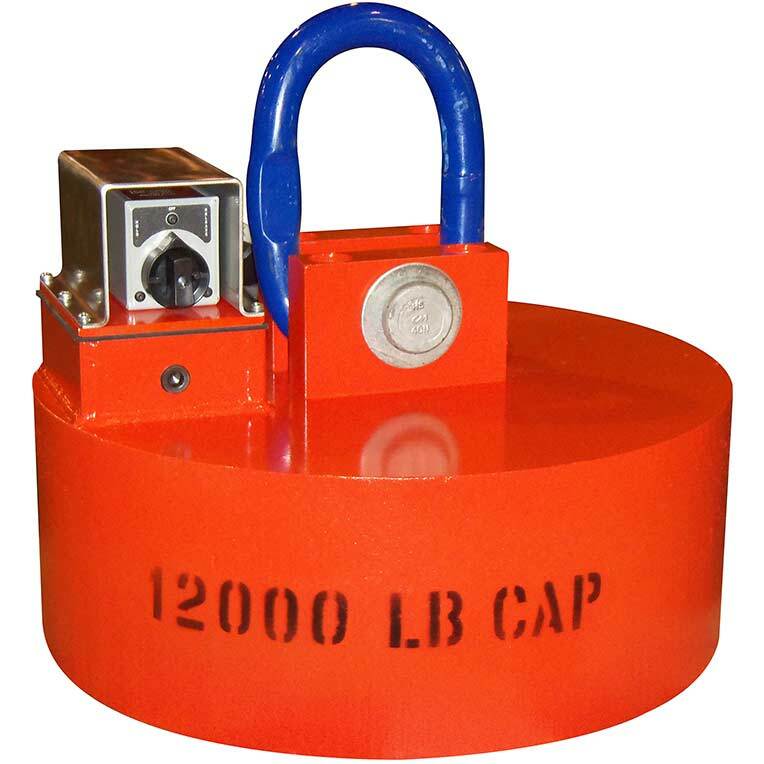 These electromagnetic lifts are an extremely valuable material handling tool. The RELM's durable construction makes them suitable for working in most environments handling thick, non-flexing items such as, steel plates, billets, die castings, forgings and more. Designed for plug-in use (no separate power supply required), the control switch for the "on, off & release" functions of the magnet are mounted on the top of the unit. When compared to our competitors electro lifting magnets, IMI's RELM series of lift magnets offers lower wattage requirements, higher lifting capacities and a lower unit weight. Magnets are supplied with a 3' long, heavy-duty cord. 100% duty cycle. RELM06-RELM12: #16-3 SO Cord with mating twist-lock plug and receptacle. RELM16-RELM20: #14-3 SO Cord with mating twist-lock plug and receptacle. Note: RELM Holding Values are stated at 50% of the actual value for a 2 to 1 design factor. RELM's are not intended to be used as scrap handling magnets. Picking up several pieces of steel at once is not recommended and may result in serious injury or property damage. Never stand under load being lifted. Always use extra caution. Only use magnetic lifts on material that does not flex or bend. The surface of the lift, and the load being lifted, need to be clean and free of chips, oil, slag, dirt, etc. Lifting magnets must be centered on load. You must have 100% coverage on a flat surface to operate the magnet. Not recommended for painted or finish coated surfaces.